Revvoensovet (Revolutionary Military Council) Street is plain, but it dissimulates a lot of interesting things for curious traveller. The street settlement is an interesting point. The one began to settle eight centuries ago. Although there were always difficulties with water due to the lack of springs, and it wasn’t adapted for transporting, because it rests on the gully. What is so attracted in this city corner for our forefathers, is unclear. It is well known that Napoleon died on the island of St. Helena. Another interesting fact is that he knew about it soon after his coronation, and may therefore was somewhat superstitious. The two-storeyed building, built in the second half of the XVIII century, which subsequently was refused by Napoleon, in 1796-1797 he organized the first political club freethinkers. It was organized by Alexander Mikhailovich Kakhovsky – the participant of the Suvorov marches. The meeting of Smolensk freethinkers just took place in this house. This secret political club combined Smolensk nobles, who didn’t like the ruling, made by Paul I. At the meetings were read forbidden books, criticized the king’s orders and new orders. This activity ended with arrests and trials. The investigator called representatives of Smolensk Club «Jacobins» and compared with Marat and Robespierre. 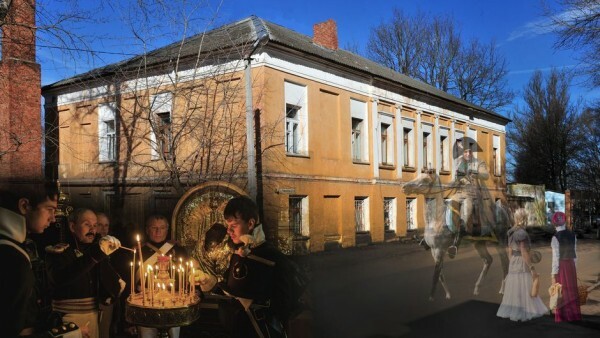 As a result, three of Smolensk freethinkers were deprived of rank, noble titles, and took in the castle, ten people sent to deportation, and the rest were dismissed from their posts. And this old house belonged to one of the members «Catherine Eagles» — Mikhail Vasilyevich Kakhovsky. Strict proportions, facade composition, their details give the reason to believe that it is a monument of the Classical period residential architecture. Kakhovsky was a countryman and a colleague of his powerful patron Prince Grigory Potemkin. Kakhovsky commanded by the troops in the Crimea after it was associated with Russia. Mikhail Vasilyevich with his brother Vasily Vasilyevich Kakhovsky did a lot for the Black Sea region arrangement and absorption. Brothers merits appreciated by the Empress Catherine II. The letters, in which Catherine thanked them for their service, were saved. After the death of Potemkin, Kakhovsky became his successor as a commander in southern Russia. Later he was sent as a governor-general to Nizhnygorod government at first, and then to the Penza one. RMC Street is also interesting, because in spite of houses of various size — private and apartment ones, marked by the post-war austerity and architectural extravagances of the past centuries, buildings in it are wonderfully composed in a harmonious ensemble. Part of this ensemble is the house number № 17. The building with a steep pitched roof, built in the middle of XIX century, faces the front line of the street, and calls attention to itself by rich decoration of the facade. The architects saw the Baroque style in it. Despite the fact that the building size is not great by today’s standards, it seems to be a monumental and thoroughly.